Learn to cook authentic North Indian food from Punjabi mother and daughter team, Surinder and Safia. You will learn how to make Punjabi food, completely from scratch, using only traditional methods and being taught in the style that Punjabi mothers teach their daughters. You will be given access to all the information that is normally only found inside the homes of Indian families. Teaching you from their own family kitchen, using many of the utensils and saucepans that belonged to their late mother / grandmother Seso Kaur from the time when she first arrived in England, you will learn, step-by-step, how to make a full 3-course Punjabi meal from start to finish. Upon enrollment, you will be sent a starter pack of spices, which contains each of the spices you will need on this course, with enough of spice to make each of the dishes once through. All the images featured below are taken directly from your course material and video footage. Chapters 2 - 7 contain 4 elements within each chapter. 1. Your ingredients and equipment list specifically for Pakore. 3. 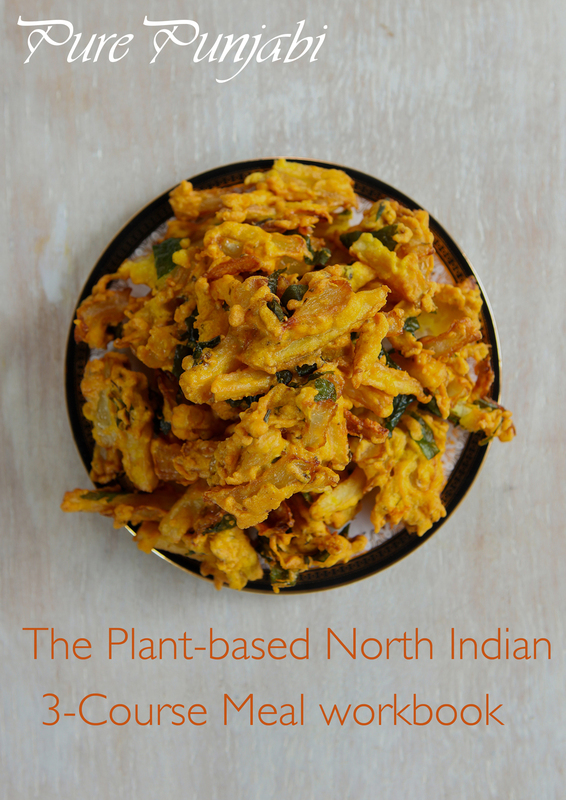 A quiz, to test that you have grasped the key concepts needed for you to make Pakore. This quiz is not here to put a dampener on your fun! It is to make sure that you have noted all of the factors that are important to making sure that the Pakore turn out exactly as they should - these are all the things that we emphasis to our students when we teach them, and want to make sure that you too have these aspects highlighted. If you aren't sure about some of the answers, just watch the video again - as many times as you like. 1. Your ingredients and equipment list specifically for Masoor di Dhal. 3. A quiz, to test that you have grasped the key concepts needed for you to make Masoor di Dhal. This quiz is not here to put a dampener on your fun! It is to make sure that you have noted all of the factors that are important to making sure that the Dhal turns out exactly as it should - these are all the things that we emphasis to our students when we teach this dish, and want to make sure that you too have these aspects highlighted. If you aren't sure about some of the answers, just watch the video again - as many times as you like. 1. Your ingredients and equipment list specifically for Saag. 3. A quiz, to test that you have grasped the key concepts needed for you to make Saag. This quiz is not here to put a dampener on your fun! It is to make sure that you have noted all of the factors that are important to making sure that the Saag turns out exactly as it should - these are all the things that we emphasis to our students when we teach this dish, and want to make sure that you too have these aspects highlighted. If you aren't sure about some of the answers, just watch the video again - as many times as you like. 1. Your ingredients and equipment list specifically for Roti. 1. Your ingredients and equipment list specifically for Jeera Chawl. 3. A quiz, to test that you have grasped the key concepts needed for you to make Jeera Chawl. This quiz is not here to put a dampener on your fun! It is to make sure that you have noted all of the factors that are important to making sure that the Jeera Chawl turns out exactly as it should - these are all the things that we emphasis to our students when we teach this side dish, and want to make sure that you too have these aspects highlighted. If you aren't sure about some of the answers, just watch the video again - as many times as you like. 1. Your ingredients and equipment list specifically for Seviyan. 3. A quiz, to test that you have grasped the key concepts needed for you to make Seviyan. This quiz is not here to put a dampener on your fun! It is to make sure that you have noted all of the factors that are important to making sure that the Seviyan turns out exactly as it should - these are all the things that we emphasis to our students when we teach this pudding, and want to make sure that you too have these aspects highlighted. If you aren't sure about some of the answers, just watch the video again - as many times as you like. You will have access to the content on this course for one year, from the time of enrollment. When you enroll you will be sent a spice starter kit. Self-employed Entrepreneur & Business Woman, Private Personal Trainer, Life & Business coach, Cookery School Founder, Spice producer. Surinder is Founding director and one half of the mother-daughter team that runs Pure Punjabi. A self-employed business woman, she has raised three grown-up children, while running three businesses, before founding Pure Punjabi in 2010. In 2013 a partnership with her daughter Safia was formed and the business took off from artisan spice production with the creation of the cookery school, pop-up restaurants and private dining. Surinder's personal training & life coaching was founded in 1999 and remains a passion and current business with clients of many years who work with Surinder to maintain their health, fitness & holistic well-being. Cookery School Founder, Pop Up Restaurant Organiser, Spice Producer, Private Chef & International Gourmet Guru. Safia is co-director and one half of the mother-daughter team that runs Pure Punjabi. In addition to the cookery school workshops for adults, Safia also launched kids cookery workshops. She also expanded the pop-up restaurant side of the business into weddings, catering for the English market. They focus on giving foodies from outside the Punjabi community access to the knowledge and culinary skills found inside the homes of Punjabi families. Together with her mother, Surinder, their award-winning artisan spices and The Pure Punjabi Cookery School (both a physical school, and an online cookery school) aim to maintain and pass on the traditional North Indian culinary skills that are becoming a dying art. Raised by her mother in the pure culinary traditions of the Punjabi kitchen, Safia loves to create fusion dishes from her Anglo-Indian heritage as well as her childhood spent in Europe and South Africa. Through Pure Punjabi, Safia and Surinder are determined to get pulses to the forefront of home cooking. Many of their spice products involve using pulses, in fact, their 3-course meal gift pack uses pulses for the starter, the main and the dessert! For 2016, the International Year of Pulses, Safia has written a free, online mini-course about pulses, which contains all the essential information that you need to know when cooking with pulses. It will allow people to really come to grips with pulses and learn how to use them. .Awards: Finalist, Young Entrepreneur, Enterprising Wiltshire Awards 2014. FreeFrom Food Awards 2017, Bronze for Masoor di dhal (Red lentil dhal), in the No Top 14 category (Free of the top 14 allergens).